The internet of things (IoT) – the connecting of billions of everyday and industrial devices using tiny sensors that transmit data and share information in the cloud – is revolutionizing the way we live and do business. IoT platforms are expected to save organizations money, improve decision-making, increase staff productivity, provide better visibility into the organization and improve the customer experience. IHS Markit predicts that the total number of IoT devices will grow from 27 billion in 2017 to 125 billion in 2030. Six in ten U.S. companies now have some type of IoT initiative underway – either formal or experimental, according to IT trade association CompTIA. 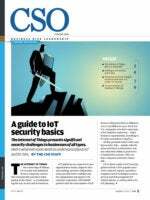 CSO's Basic Guide to IoT Security, gathered from CSO's popular interviews with IoT experts, provides a complete look at techniques used to prevent and defend against IoT-related attacks, as well as advice for IoT planning.